As a graduate student, I worked as an intern at a large corporation. Into my second week, I had collected data on a project and wanted to place the papers in groups based on processes. When I requested my mentor for a few paper clips, I had my first experience with complexity. While handing over the paper clips, my mentor told me that to get a box of paper clips, the organization required 17 signatures!. Ever since I have been intrigued and baffled at the complexity that is an integral part of modern organizations. On the one hand, the advent of new technologies at a pace that could not have been imagined even at the turn of the century, new entrants more than willing to disrupt traditional frameworks and mindsets, and the changes in customer expectations, have combined to produce an unstoppable force. One would expect organizations to seize the opportunities and move forward. The twin factors that can provide a competitive advantage in today’s business landscape are agility and adaptation. Few businesses show the characteristics needed for speed and change. On the contrary, the typical response is for more processes, endless meetings, brainstorming, disengaged employees, and ever escalating costs. Why is there such a disconnect between what is needed and what happens? 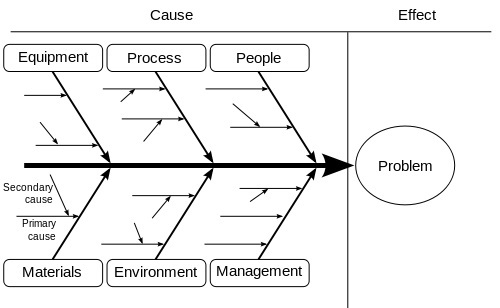 First, very rarely do organizations try to figure out the cause of any problem. The classical approach is to look at the symptoms, not the disease itself. It is like applying a band-aid to an ever enlarging sore. Second, organizations typically argue that the problem lies elsewhere – in regulation, in the economic environment, in political uncertainty, in unfair competition – and never within the organization itself. Third, it is hard to measure certain problems. As an example, when was the last time you came across anyone in your organization questioning the cost of time wasted on unproductive meetings? An Atlassian estimate places the amount spent on unproductive meetings at US$ 37 billion per year (2016). A Harvard Business School app quickly shows that in a typical organization, an hour’s meeting attended by 20 people is over $1,000 in opportunity costs. Finally, organizations are in the comfort zone owning “collective responsibility” for everything. In other words, there is no ownership and hardly any accountability. 1. Performance is a function of what people do (behavior). 2. Behavior is a function of people’s rational responses to their context. Thus, Smart Simplicity tries to make desired behaviors rational. Observed behavior, and not an assumed ideal state (what people should be doing), needs to be the focal point. For organizations that embrace simplicity, the rewards are significant. Large organizations report order-of-magnitude benefits achieved through simplification. In my experience, I have seen concept-to-market cycles shrinking by 25%, costs being reduced by 30%, and revenues going up by 15%, all due to simplification. 1. A “complicatedness survey” that identifies the processes that show built-in characteristics of complexity. Example: In the physical world, customers willingly scan the shelves of supermarkets to find what is best suited to their requirements. In contrast, in the digital world, customers are extremely impatient for results. If a prospect visiting your web page cannot find what she is looking for in the first five minutes, she is likely to give up the effort and start looking for alternatives. A significant part of complexity starts with the leadership team. A team that focuses on providing the “best possible solution” invariably ends up having complex processes. Instead, it may be prudent to start with a “good” solution and make it better on a continuum. 2. Diagnose the root cause. Admittedly, this is the most difficult part. Example: When Paul O’Neil took charge of ALCOA, his first message to shareholders had a single focus – employee safety. Petrified investors rushed out of the meeting to sell their shares. A few years later, ALCOA had regained its position in the industry. Counter-intuitive as it may seem, the focus on safety reduced accidents, empowered employees, dramatically brought down attrition, and increased productivity to record levels. Obviously, those who had sold off their shares had to regret the decision. Organizations can identify the root cause if and only if they are willing to take a deep dive into socio-cultural contexts in which they operate. Such a soul searching requires enormous courage and the willingness to go against the tide of conventional wisdom. 3. Test-drive. Just as rapid prototyping is the preferred route to innovation, organizations should take up pilot projects to test-drive simplicity. Example: Toyota considers more designs than its US and European counterparts and yet can shorten the concept-to-market cycle to 18 months compared to 4 years for competitors. The magic is in its now-famous production system that adopts a “pull” design and carries no inventory in contrast with major manufacturers who even today rely on a “push” system and loads of inventory. The Swedish furniture maker Ikea has successfully replicated the system resulting in close-to-zero waste and extreme modularity in design. Logs of wood go through a “scan” to determine the most appropriate way of slicing them. 4. Implement: Once a pilot project is tried and adjustments made as required, organization-wide implementation is the logical final step. Example: The first Indian company to reach both CMM Level 5 and PCMM Level 5 in software technologies achieved the incredible feat in 18 months. The secret was to de-layer bureaucratic approaches and empowering middle-level managers to do whatever was required, within a broad set of core values, to achieve the desired results. The organization that I referred to in the opening paragraphs was able to achieve a 60% increase in ROI by simplifying processes across the board. The message is clear. In a world where organizational life-spans are shrinking, and turbulence is a given, only those that can embrace simplicity will survive.